"Catch the Energy, Feel the Spirit, & Soothe the Soul" when you listen to this evolving mixture of all the timeless elements in American music, R&B, Pop, Blues,Smooth Jazz, & Soul funneled into a tornado of "Soultry", throaty heart searching warmth. previous commercial musical endeavors have locked our expectations into, and thus loaded the market with the sound-a-likes. Faye Raye is Real, Raw, and on Point. Listen outside the box to a New Face with a New Sound introducing a New Genre, "Inspirational Soul." This Singer, Song Writer & Guitarist is singing your life's moments and you've been here before. It's not Deja Vu, it's all the things we've been through but new. Enjoy. "Catch The Energy, Feel The Spirit, Soothe The Soul"
I think this cd is fabulous. The cd gives me a reason to get up and go on. I am a 17 year old and school and life begins to test you at times and this cd shows that we should never give up no matter what the circumstances. I love it, it's probably one of the smoothest yet touching albums that i've heard in a LONG time! Thank you for sharing! It's greatly appreciated! Faye Raye is HOT!!! This is a must-have CD to soothe the soul! This is a dazzling CD. It was long over-due. Faye Raye is awesome as she reaches into the soul and out to the sublime. Absolutely Stunning!!!! A unique sound that comes across real and on point !! Strong, passionate lyrics that touch on everyday and everyones reality. I can feel her inner-spirit on every track. A must have in my Jazz/R&B section to enjoy with my friends and family. Real music for the soul !!! Great Job !! Great ! Nothing else can be said. I love this CD. This is one of the best CD's I have listened to. I can't belive I actually liked it because I am used to more fast paced songs but this is really good. Wow. Great music! I can't wait for the next release. I already own the cd and listen to it ALL the time. I just bought five for Christmas presents. It's great music! I can't wait for the next release. 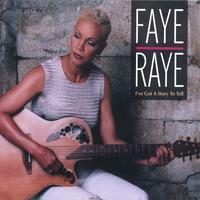 This CD shows the emotion that comes from this Artist, Raw but kind and has allot of groove, Good Listen, Faye has lots of Passion on thi Project. Good Work. I think the CD is the most inspirational CD I've heard in a very long time...It helps me get through each day no matter what the circumstances. I cant say enough good things about it..Words cant describe the feeling I get when I listen to it...it such a peaceful feeling I can actually get lost in the lyrics and music.. The lyrics themselves are so bold and real you can tell that they are life learning lessons for all to benefit from. I can relate to every song on the CD in one way or another...I would love to see her do a show somewhere and cant wait for her next CD....Great Job! Best CD I've bought in 2 years or better. Thank you for sharing this with me...It has changed my outlook on life.